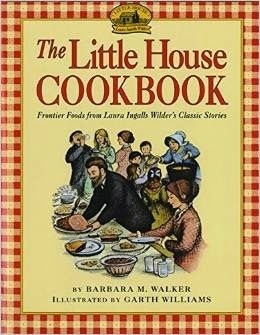 Last week I shared with you the gem, The Little House Cookbook: Frontier Foods from Laura Ingalls Wilder's Classic Stories by Barbara M. Walker. If you are a Little House fan, you know of Laura's detailed descriptions of the many dishes she describes in her nine books. Barbara removes any mystery surrounding the pioneer foods of yesterday and provides recipes and historical context in her 240-page book. Prior to The Little House Cookbook's publication in 1979, Barbara wrote an article about her trip to De Smet, South Dakota. Accompanied by her five-year-old daughter Anna and a distant cousin, the trio went by the way of the Ingalls home sites. The article was published in the New York Times Travel Section, and it caught the attention of the children's editors of Harper & Row (now HarperCollins). Barbara Walker took the time for an interview for readers of Little House Companion blog. 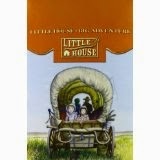 Little House Companion: When were you first introduced to the Little House books? Barbara Walker: In 1967, when daughter Anna was four, I appealed to the children's librarian in Ossining for a series (to reduce the frequency of library trips). She produced both the Little House books and a folder of materials gathered on her own tour of the sites. LHC: What inspired yo to write The Little House Cookbook? Barbara: Anna and I had used two cookbooks based on children's classics and found them wanting. As I read the Little House series to her, we recreated some of the food. I realized the Ingalls story was all about staving off hunger. I thought a cookbook with "authentic" recipes would help readers better grasp the difficulties of pioneer life and learn something about the sources of their own food. LHC: You included over 100 pioneer recipes.. How did you research the recipes to keep them authentic to pioneer days? Barbara: I had no access to the primary material now in the Hoover Library, but I was able to browse the open-stack cookbook collection of the New York Public Library, where I found many of the secondary sources listed in my bibliography. That short list seems laughable today, when there are scholarly books on corn and salt and vinegar-making. But back in the sixties and seventies, Julia Child reigned, and home cooks were all Mastering the Art of French Cooking. American cooking was not celebrated until it was gone. LHC: Was any of the research especially difficult? How did you overcome it? Barbara: The greatest challenges were Birds'-Nest pudding (a name used for a variety of desserts), Swedish crackers (spared a dreadful mistake by a last-minute discovery), and blackbird pie. LHC: How did your family respond to your pioneer test kitchen? Did you make and eat every recipe? Barbara: Anna was often part of my testing and my husband was a good sport. I made every recipe at least twice, and some three-or-four times. After completing each chapter, I gave the recipes to friends to test (see Acknowledgements). Killing blackbirds is illegal in this state, but I found a game warden (now conservation officer) willing to shoot starlings, considered pests. He delivered to my door a dozen or more birds already plucked and dressed. I prepared a pie for supper and we found the birds impenetrable. Next day I baked the same pie all morning and invited the director of the local nature preserve for lunch. We had an unforgettable, delicious meal (not unlike medievals feasting on ortolans!). Barbara: I am a practical person. I still make my own sourdough because homemade bread offers the biggest payoff of any kitchen labor. It perfumes the house, transforms a meal, and gets more attention from guests than labor-intensive preserves. I make apples and onions with some frequency, and I miss my supply of homemade mincemeat. LHC: Is there anything else you would like readers to know? Barbara: The Ingalls family saga was neither heroic nor does it reflect enduring family values. Once they left Wisconsin, where they had gardens and livestock of their own and relatives nearby, the Ingallses never again ever achieved the same level of comfort. Pa was caught up in westward fever. He was more capable than many pioneers, but he resisted turning back, and he put his family at risk. "Enduring family values" assure that the family endures. The Ingalls family did not. The four daughters produced only one child and no grandchildren, in part because of their social isolation and the impact of the Long Winter on their health. 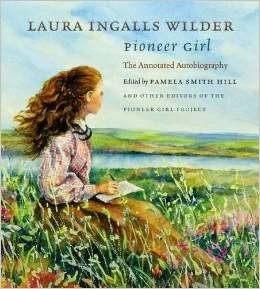 Fortunately, the recent publication of Pioneer Girl, Laura's first draft manuscript with its dark passages, is beginning to offset the misleading picture painted by the TV series. Thank you, Barbara, for taking the time to answer a few questions. Last week I made my first recipe using The Little House Cookbook. I surprised my family with a vinegar pie. It was a little different, and certainly pioneer-ish. My son, especially, loved it. I wonder what I'll make next. If you haven't already done so, be sure to read my review (linked here) of The Little House Cookbook and the other Little House-related reviews.